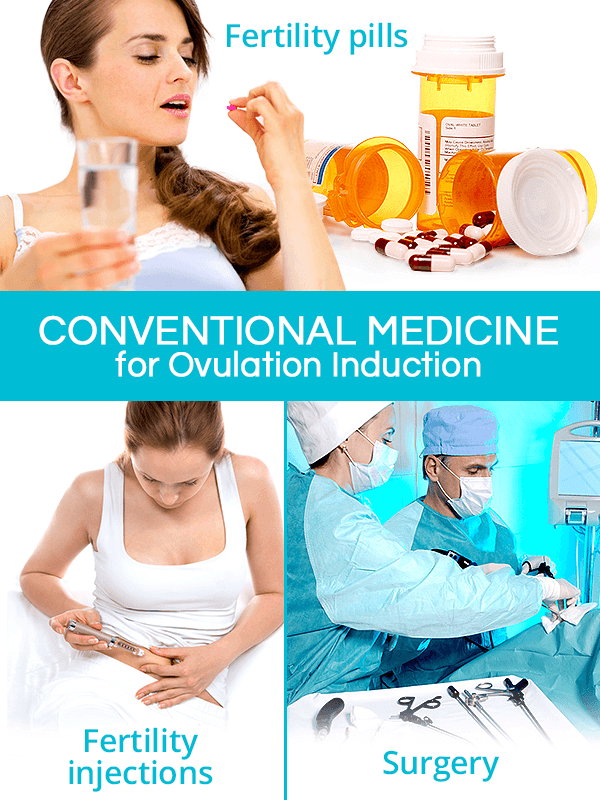 In medical terms, ovulation induction is a treatment of ovulation problems with the use of medications or surgery. 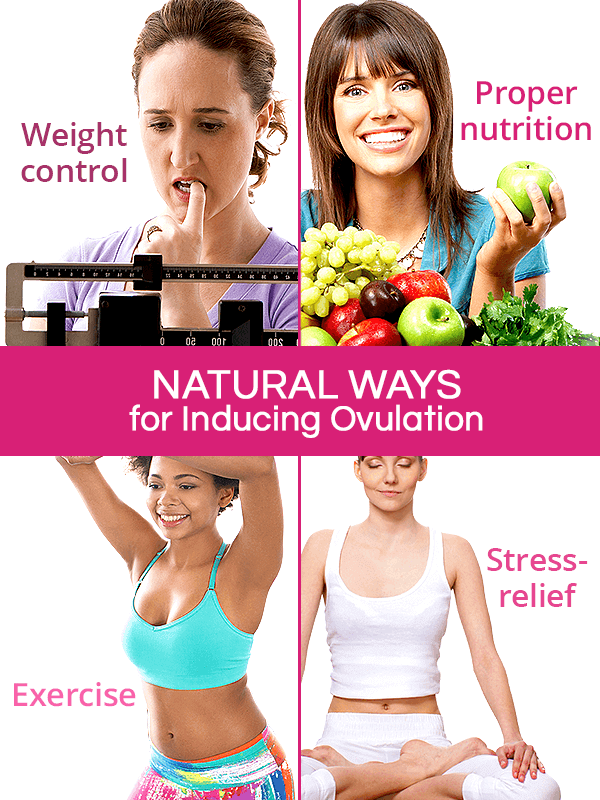 However, many women may not know that they can induce ovulation naturally through a wide array of other methods, including a balanced diet, weight loss, herbal supplements, and more. Keep on reading to learn how to increase ovulation with three effective approaches, including lifestyle habits, alternative medicine, and conventional medicine, so that you can put your ovulation issues behind and enjoy a ripened fertility. Women are generally advised to implement healthy lifestyle habits as the first line of treatment as well as in combination with alternative and conventional treatment options. Reaching and maintaining a healthy body mass index is the first recommendation for women with abnormal ovulation. Studies among obese women with ovulation issues have shown that even a 5% - 7% loss of BMI was sufficient to restart or regulate ovulation. Conversely, women with insufficient weight or eating disorders who safely gained weight promptly started ovulating. Depending on whether a woman has to lose or gain weight, she can do so with diet and exercise, both of which are discussed below. A well-balanced fertility diet can serve several purposes, including helping women maintain optimal weight, boosting fertility by improving egg quality, and resolving nutritional deficiencies behind abnormal ovulation. Moreover, studies have shown that the Mediterranean diet rich in healthy fats, grains, and vegetables may protect against ovulation problems. Adjusting one's workout routine to include moderate-level fertility exercise can jump-start ovulation and make cycles regular. It can also help shed extra pounds. Extreme and strenuous exercises should be avoided as they might lead to a hypothalamic amenorrhea, when menstruation and ovulation stop entirely from occurring. Instead, good ways to get the recommended 150 minutes of physical activity a week and solve ovulation problems include jogging, swimming, or dancing. Since prolonged high stress elevates cortisol levels, which, in turn, can prevent the pituitary gland from releasing LH, finding methods to relieve it is important in treating ovulation issues. The most popular relaxation techniques include breathing exercises, aromatherapy, yoga, or meditation. Naturally occurring in plants, phytoestrogens resemble body-made estrogen, but with lower potency. They bind to estrogen receptors or mimic estrogen functions in the body, thus encouraging the endocrine system to balance hormonal levels. 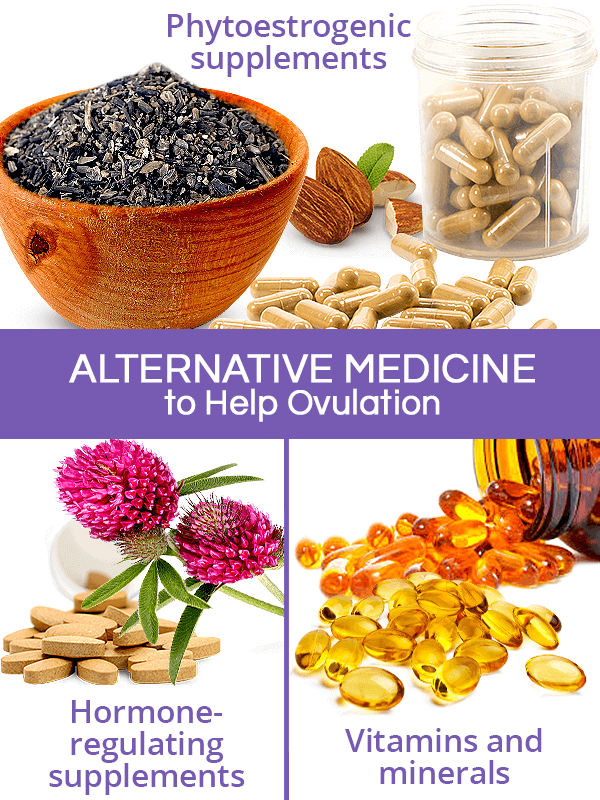 Most popular phytoestrogenic herbs for ovulation induction that have shown to regulate hormonal levels, periods, and egg release include red clover, black cohosh, ginseng, or vitex. These types of supplements directly address the root of ovulation problems, namely hormonal imbalance. Instead of supplying the body with external estrogens, hormone-regulating supplements, such as Macafem, stimulate the endocrine and pituitary glands to produce the hormones the body needs for its optimal functioning. They are considered the safest way to resolve ovulation issues as they cause little to no side effects. Although a well-balanced diet can ensure proper nutrition, some women consider taking vitamins and minerals for ovulation stimulation. Folic acid. Research has shown that women who take 400 mg of folic acid daily before getting pregnant experienced lower rates of ovulation issues. Multivitamin containing an array of vitamins, such as B, C, and E, and minerals like zinc, iron, and calcium, might help regulate menstrual cycles and reduce ovulatory infertility. Lipoic acid is a strong antioxidant shown beneficial in promoting a healthy reproductive system and regular ovulation. Omega-3 fatty acids supplements can aid in hormonal regulation, including supporting uterine and ovarian function and making ovulatory cycles regular. CoEnzyme Q10 supplements were found to improve egg quality, thus possibly helping in their development and subsequent release. 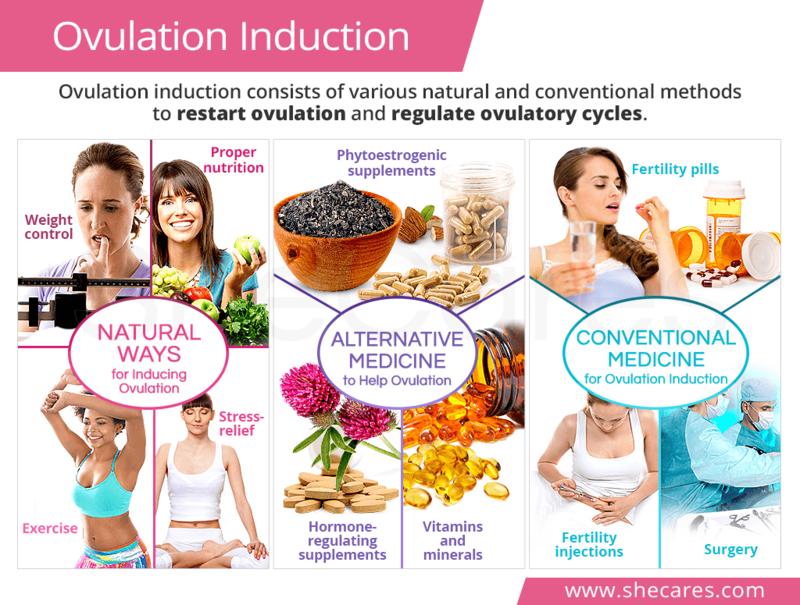 Ovulation induction can also be achieved with conventional medicine, including ovulation-boosting medications or surgery, depending on the underlying cause. The first line of conventional treatment is with a medication to induce ovulation called clomiphene citrate, which stimulates the pituitary gland to release adequate hormones and initiate egg release. For PCOS women with ovulatory infertility, ovulation-stimulating drugs, such as metformin, are often added to tackle insulin resistance and restart regular cycles. Read more about fertility pills and injections. Surgical options are considered after medications fail to treat ovulation issues. The most common procedures for ovulation stimulation include laparoscopic ovarian drilling and ovarian wedge resection. They are especially effective among women with PCOS-triggered infertility, although it is not exactly understood how these procedures work to induce ovulation and regulate menstruation. Women with ovulatory infertility are encouraged to first consider lifestyle habits to induce ovulation naturally, including achieving a healthy BMI, consuming an ovulation-friendly diet, focusing on moderate exercises, and relieving stress to reverse hormonal imbalance. Other natural ways to ovulate more regularly consist of herbal supplements that help regulate hormones, such as Macafem, as well as various vitamins and minerals. Finally, medications to help a woman ovulate work directly on the endocrine glands to optimize their function.